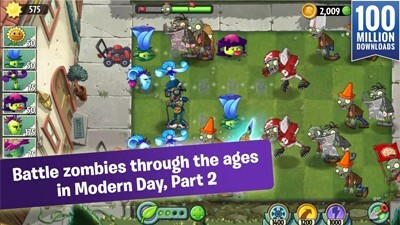 Here's the 2nd part of the quick walkthrough and strategy guide for the "Modern Day" world in the strategy defense mobile game - Plants vs. Zombies 2: It's About Time! The end is the beginning! Return to moments before you left in a contemporary contest stocked with zombies of every egregious era! - Play Jurassic Marsh Quick Walkthrough and Strategy Guide Part 1 first before this guide. - Lobs explosive buds. When near Moonflowers, their attacks will cover 3 lanes. For best results, always start from the center lanes. - Strategic plant that can move around plants. Works like a Potato Mine also. - Once deployed, tap and hold then drag to any plant to switch places. If zombies managed to get close to them, they will automatically change to a Grapeshot, Mines or any single use plant. - Notable use: If one of your plants is being attacked, you can switch that to your escape root plant to save them. - Drags down a zombie that enters it's lane. When powered, it can dispose of three zombies before it expires. - Start with 3 Moonflowers on the center lanes, then start placing Dusk Lobbers to defeat the first wave. Continue and complete the formation. - Blover: Use to blow away flying zombies. - Support: Cherry Bomb, Chili Bean, and Potato Mine, and Primal Potato Mine. During the final wave, use a Cherry Bomb on the "Golden Mummy zombie" then plant Chili Bean or Mines vs those "newspaper" zombies. - Start with 3 Moonflowers on the center lanes, then start placing Dusk Lobbers to defeat the first wave. Continue and complete the 1st and 2nd column. - Shadow-shroom: vs tough zombies, use this also in front of those Zombie Bulls to force it to throw the little zombie early on. - Support: Cherry Bomb, Chili Bean, and Potato Mine vs those "newspaper" zombies. - Refer to the "Tips to Remember" section above on how to use the Escape Root plant. - PF: Any to defeat that pesky octopus. 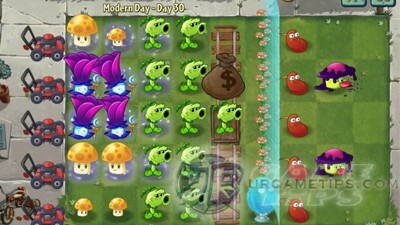 - Make sure that you have at least 2 plants per row to defeat tough or flying zombies. - Coconut Cannons: Save them, then deploy and shoot to defeat tough zombies like the octopus. Nice plant to move around using your Escape Root. - Escape Root: Deploy them on the 3rd column, use if necessary. Works like a Potato Mine too. - Start with 2 or 3 Moonflowers on the center lanes, then start planting Dusk Lobbers (always start from the center lanes), complete the formation. - Shadow-shroom: Use to knock off the first few zombies, use it on the Golden Tiles to get Sun early on. - Blover: Use to blow away flying zombies, best used on the Golden Tiles to get Sun. - Support: Chili Bean, Primal Potato Mine, and Cherry Bomb. Use to defeat Newspaper zombies, other tough zombies, or the Gargantuar. If you are having trouble, just tap and hold on your Mower to defeat the Gargantuar. - Complete your Sun shrooms then spam Chili Bean, Potato Mine, Primal Potato Mine, and Shadow-shroom. Should be easy, just make sure you have at least 2 per row. Feed your Shadow-shrooms do not let them wait for the zombies to eat them. - Cherry Bomb: vs those running football zombies, or group of tough zombies. - Try to focus on the right most area first to keep your front lines alive. - Go for Fume-shroom upgrade first to give an early boost to your Puff-shrooms, it's cheap anyway. - Next, get the Melon-pult and Sun Bean, then Any upgrade if needed. - Any combination you might like is ok, as long that you can finish the stage. - PF: Save to refresh your Cherry Bomb's seed packet vs Gargantuars. - Start with 3 Moonflowers on the center lanes, then plant 1 Primal Potato Mine to take care of the 3 zombies below, and 1 Shadow-shroom for the top zombie. Complete your Moonflowers. - Cherry Bomb: vs Octopus zombies, hit them before they can throw their octopuses. For the 2 Gargantuars, hit them both at once. - Support: Spam Chili Bean, Primal Potato Mine, and Shadow-shroom once you have completed your Moonflowers. - Grimrose: Use vs octopus zombies or any tough ones. Best placed on the 2 column next to a Moonflower to get a power-up. - Just start with 3 Moonflowers on the center lanes, then use Shadow-shroom to clear the first few zombies. Complete Moonflowers then spam Chili Bean, Primal Potato Mine, Shadow-shroom and Grimrose. Yes, also spam Grimrose once it cooled-down. Shadow-shrooms works best against weak zombies, to stop them from tripping your mines. - Cherry Bomb: Use vs those running football zombies. - Start reviving all Kernel-pults on the 2nd column, then the Fume-shrooms on the 3rd column. - Next, revive Phat Beats on the 4th column and the Coconut Cannon. Use the cannon to defeat the first newspaper zombie. - Revive the other Cannons (use to clear Excavator zombies or other tough zombies whenever ready) and Fume-shrooms. - The Phat Beats from the back can be revived if all other plants are alive. - PF: Cherry Bomb's seed packet vs 2nd Gargantuar. Planting a Primal Potato Mine close to the Gargantuar, then using PF to make it grow will also work. - Just start with 3 Moonflowers on the center lanes, then use Shadow-shroom and 1 Grimrose to clear the first wave. Complete Moonflowers then spam Chili Bean, Primal Potato Mine, Shadow-shroom and Grimrose. Again, spam Grimrose once it cooled-down. Shadow-shrooms works best against weak zombies, to stop them from tripping your mines. - Grimrose: Excellent for eliminating those big pianos, mech, football, and other tough zombies. Best placed on the 2 column next to a Moonflower to get a power-up. - Mower: Tap and hold a mower to quickly defeat the Gargantuar. - Any upgrades will do, here's an example: Personally, I would go for Fire Peashooter first to give Peashooters a boost. Next is Sun Bean then Cold Snapdragon or Electric Blueberry if needed. - While completing your 1st column Moonflowers, spam Shadow-shroom to clear the first few zombies. From here, spam plant more Moonflowers, and use your Chili Bean, Potato Mine, Primal Potato Mine, and Shadow-shrooms to defend. - PF: After using your first Cherry Bomb on the first running football zombie, refresh seed packet to clear the first pesky wizard. You can also use Shadow-shroom to those running football zombies to slow them down. - Cherry Bomb: Use on the first running football zombie and to destroy all wizards! - Start with 3 Moonflowers on the center lanes, and 2 Dusk Lobbers on the 2nd and 4th rows. Use Shadow-shroom to clear other zombies around. Complete Moonflowers then the formation. - Support: Spam or use Cherry Bomb, Primal Potato Mine, and Shadow-shroom to clear tough zombies. - Grave Buster: Spam from the beginning, to remove those graves. - PF: To recharge the shield of your Infi-nut. - Follow these steps: Start by planting 2 Moonflowers and 2 Sun-shrooms on the 1st column, then just before the first zombie enters, plant 1 Shadow-shroom on the 9th or 8th column so that it will die before it reaches the flowers. - Now here's the trick, do not eliminate the flying zombie, just continue and grow more Moonflowers and Sun-shrooms, but when it reaches the 1st column, blow it away with your Blover. Hopefully, you now have a complete 1st and 2nd column plants, or close. - Next, plant your Infi-nut, then let the Newspaper zombie eat 1 Chili Bean to get a PF. Quickly use it on your Infi-nut to pull up your shield. - From here on, spam Primal Peashooters, Chili Bean, and Shadow-shrooms. Primal Peashooter's knock backs will take care of those multiple Gargantuars. - Mower: Tap and hold a mower to quickly defeat a Gargantuar, if needed though. - In case those little zombies thrown by the Gargantuars managed to reach your back lanes, just quickly replace fallen plants with Shadow-shroom, then re-plant. - After completing your Sun-shrooms, just start spamming Chili Bean, and other single use plants below, this is overkill though. - Primal Potato Mine and Escape Root: Plant beneath those cannons to blow them up. - Cherry Bomb: Use to eliminate those zombies holding torches, and zombie cannons. - Mower: Tap and hold a mower to defeat the Gargantuar, if needed though. - PF: Place a Snapdragon in front of Dr. Zomboss then use PF to deal great damages. Also ok to use on Kernel-pults to stun all zombies. - Kernel-pult, Coconut Cannon, and Threepeater: Spam them on the 1st, 2nd, and 3rd columns. - Snapdragon and Spring Bean: Plant on the 4th column onwards, Spring Bean can help protect your Snapdragons. - Spikeweed: Spam near Dr. Zomboss. - PF: Melon-pult or Winter Melon vs Gargantuars or horde of zombies. - Plant on 1st, 2nd, and 3rd columns: Melon-pult, Winter Melon, Lightning Reed and Pea Pod. Just a reminder, you can stack Pea Pods to let them grow more peas. - Support plants: Chili Bean, Split Pea, and Tall-nut. - Just spam them all up, should be easy. - Citron and Laser Bean: Spam them on the 1st and 3rd columns. - Infi-nut: Place these on the 2 carts, move or drag them up or down to avoid missile attacks and other zombies. Spam more on the 5th column onwards. Note that you can revive fallen Infi-nuts with this. - PF: Infi-nut to pull up shield, prioritize the one on the 2nd column. Once the Gargantuars are out, use them on your Sun-Bean. - If all columns above are full, spam all remaining plants nearest to Dr. Zomboss to deal more damage. - Mower: Tap and hold a mower to defeat a Gargantuar. - Blue Tiles and and/or Green Tiles: Just place them on the 3 center lanes. - Puff-shroom: Spam from 2nd column onwards. Note that if you will use PF on Puff-shrooms, all of them will do their special attacks. - Fume-shroom: Spam from 1st column onwards, best placed on Green and Blue Tiles. - Magnet-shroom: Still good, keep planting but not on Green and Blue Tiles. - PF: Use it on plants placed on Blue or Green Tiles, depends which tiles have more plants on it. For best results, aim on Dr. Zomboss to deal lots of damage. You can also use PF to save targeted plants, use it before the missile lands on it. - Banana Launcher: vs wizards, Gargantuars, Dr. Zomboss or horde of zombies. Wait for it to recharge then drag and drop to your target. - Bowling Bulb and Guacodile: Just spam, use Guacodile to clear zombies near your plants. - PF: Banana to bombard zombies including Dr. Zomboss. - This should be easy, just spam all plants. - Lily Pad: Just spam from the beginning. - Chard Guard and Stunion: Use to defend your plants, plant on 3rd column onwards, 2nd column also if needed. - Pepper-pult: Place on the 1st and 2nd columns. - Rotobaga: Preferably placed on the 3rd column onwards, but it's ok to put on the 2nd column early stage. - Shrinking Violet: Use to shrink tough zombies. - PF: Use on Pepper-pult vs Dr. Zomboss: For best results, use your PF once the Big Shark starts sucking your plants. - On the 1st, 2nd, and 3rd columns, spam A.K.E.E, Red Stinger, and Fire Peashooter. Place some Endurians if needed. I also recommend placing your Fire Peashooters on the 1st column, use a shovel to replace existing plants. - Stallia: Use to stall large group of zombies, or any zombies near your attack plants. - Hot Potato: Use to unfreeze frozen plants, or to destroy an ice block created by Dr. Zomboss, creating an opening for your attacks. - Endurian: 3rd, 4th or 5th column, advance as you go. If you have 2 or more Endurians on a lane, you can use your Shovel to remove 1 and replace with any attacking plants. - Note: Do not plant anything on those Brown Tiles unless you want to trigger the Boulder Rock to clear all zombies. You don't have mowers so use this in case a zombie manages to break your defense and reach the 1st column. - For the 2nd and 3rd column, spam Phat Beats and some Spore-shrooms. - Celery: Place this plant on the 4th and 5th column. - Garlic: I think you just need 1 to defend the 3rd column Boulder Rock triggering tile. - If your back lines and defense are ok, start spamming Phat Beats on the 6th column, near Dr. Zomboss to deal damages on him. - PF: Phat Beats that are near Dr. Zomboss. - PF: Primal Peashooter vs horde of zombies. - Primal Wall-Nut and Primal Potato Mine: anywhere from the 3rd column onwards. - Cactus: Can be placed anywhere from the 2nd column onwards.